Our A100 Series Anemometers and W200 Series Windvanes can optionally be fitted (during manufacture) with the new /HE-4 internal anti-icing heater to help alleviate problems due to icing conditions. Because the /HE-4 heater is fitted inside the instrument, anti-icing effectiveness is improved (compared to the HE-1 and HE-2 types which the HE-4 supersedes), there are NO extra cables and NO change to the instrument shape, dimensions or appearance as compared to the standard/unheated instrument version (however a slightly thicker instrument cable may be fitted to provide extra wires for the heater connections). This means that fitting the /HE-4 heater option does not affect the airflow around the instrument, so the calibration and characteristics of the instrument remain unaffected (unlike the external /HE-1 and /HE-2 heater types). For this reason, the /HE-4 heater is recommended for applications requiring the highest accuracy where an anti-icing heater is also necessary. The /HE-4 heater is fitted inside the instrument extension tube ("stem") and is rated at 6W (24V supply, 250mA current). Power is supplied to the heater element via two extra/spare cores in the standard instrument cable. When /HE-4 heaters are fitted to both an anemometer and windvane, the pair will consume around 12 Watts (approximately 500mA). This is sufficient to keep the shaft/bearings free from ice under most conditions, however extreme conditions can still result in a build-up of ice/snow on the unheated rotor cups that will degrade accuracy/calibration. The /HE-4 is available as a 24V version as standard, a "/HE-4/12V" version for 12V operation (also 6W rated, 12V supply, 500mA current) is now available too. Note that there is NO controller/thermostat built-in to the heater - it must be controlled by your logger or other equipment you supply. The new "/SE Option" (Severe Environment Option) includes the /HE-4 heater together with a number of other enhancements which may also be beneficial in cold/icing conditions. 6 watts per instrument is sufficient to keep the shaft/bearings free from ice under most conditions, however extreme conditions can result in a build-up of ice/snow on the rotor cups which will affect accuracy/calibration (or could even stop the rotor in extreme cases). Anti-icing heaters are not usually practical if the installation is battery or solar powered due to the high power requirements. The heaters are rated at 6 Watts per instrument, that is to say an anemometer and windvane pair which are both fitted with heaters will consume around 12 Watts (1 Amp with 12V/HE-1 or 500mA with 24V/HE-2). There is no controller/thermostat built-in to these heaters, however many applications involve the use of a data logger or PLC which have relays which are capable of switching these heaters on/off as required. One of our T351 temperature screen/probes may be suitable for such a data-logger/PLC to measure the air temperature to gauge the need for heating. Specifications correct at time of writing and may change without notice. Contact us to confirm latest specifications. While the HE-4 internal heater is now the preferred anti-icing solution, existing A100 Series Anemometers and W200 Series Windvanes can be fitted with external anti-icing heaters HE-1 or HE-2 (as a kit fitted by the user) to alleviate problems caused by icing conditions. 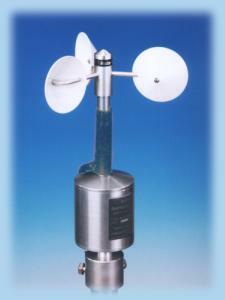 There is a small effect on the accuracy/calibration of anemometers when a HE-1/HE-2 external heater is fitted to them. These HE-1/HE-2 heaters are fitted to the outside of the instrument extension tube ("stem") and dissipate approximately 6 Watts each when connected a 12V (HE-1) or 24V (HE-2) power supply with some sort of thermostat/controller. Power is supplied to each heater via an additional cable (not via the standard instrument cable). NOTE: If an installation uses long cables, the resistance of the cables may be significant compared to the heater resistance which will cause the power dissipated in the heater to be reduced and may reduce anti-icing effectiveness. 12V heater elements have a resistance of around 24 Ohms, and the 24V types around 96 Ohms, so the effect of long cables is less with the 24V types. The use of the 24V heaters is preferable if long cables are involved in an installation. In the case of the HE-4 "internal" heaters, a short instrument cable should be used and the heater wires extended using a heavy-gauge cable to reduce cable losses. HE-4 heated versions of instruments will only be supplied with limited cable lengths - refer to the HE-4 specification sheet for details. Page Rendered in: 0.556114 seconds. - Powered by Mambo.